Papel picado is a decorative craft made by cutting elaborate designs into sheets of tissue paper. Papel picado is considered a Mexican folk art. The designs are commonly cut from colored tissue paper using a guide or template, a small mallet, and chisels, creating as many as fifty banners at a time. Papel picado can also be made by folding tissue paper and using small, sharp scissors. Common themes include birds, floral designs, and skeletons. Papel picados are commonly displayed for both secular and religious occasions, such as Easter, Christmas, the Day of the Dead, as well as during weddings, quinceañeras, baptisms, and christenings. In Mexico, papel picados are often incorporated into the altars (ofrendas) during the Day of the Dead and are hung throughout the streets during holidays. In the streets of Mexico, papel picados are often strung together to create a banner that can either be hung across alleyways or displayed in the home. La Calavera Catrina or Catrina La Calavera Garbancera is a 1910–1913 zinc etching by the Mexican printmaker, cartoon illustrator and lithographer José Guadalupe Posada. She is offered as a satirical portrait of those Mexican natives who, Posada felt, were aspiring to adopt European aristocratic traditions in the pre-revolution era. La Catrina has become an icon of the Mexican Día de Muertos, or Day of the Dead. San Andres Mixquic is a community located in the southeast of the Distrito Federal in the borough of Tláhuac. The community was founded by the 11th century on what was a small island in Lake Chalco. “Mixquic” means “in mesquite” but the community’s culture for most of its history was based on chinampas, gardens floating on the lake’s waters and tied to the island. Drainage of Lake Chalco in the 19th and 20th century eventually destroyed the chinampas but the community is still agricultural in nature, despite being officially in the territory of Mexico City. A calavera [plural: calaveras] is a representation of a human skull. The term is most often applied to edible or decorative skulls made from either sugar or clay which are used in the Mexican celebration of the Day of the Dead and the Roman Catholic holiday All Souls' Day. Calavera can also refer to any artistic representations of skulls, such as the lithographs of José Guadalupe Posada. The most widely known calaveras are created with cane sugar and are decorated with items such as colored foil, icing, beads, and feathers. Self-Help Graphics & Art, Inc. is a community arts center in East Los Angeles, California, USA. Formed during the cultural renaissance that accompanied the Chicano Movement, Self Help, as it is sometimes called, was one of the primary centers that incubated the nascent Chicano art movement, and remains important in the Chicano art movement, as well as in the greater Los Angeles community, today. 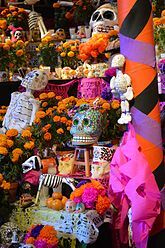 SHG also hosts musical and other performances, and organizes Los Angeles's annual Day of the Dead festivities. Throughout its history, the organization has worked with well-known artists in the Los Angeles area such as Los Four and the East Los Streetscapers, but it has focused primarily on training and giving exposure to young and new artists, many of whom have gone on to national and international prominence. Pan de muerto, also called pan de los muertos in Mexico, is a type of pan dulce traditionally baked in Mexico during the weeks leading up to the Día de Muertos, which is celebrated from October 31st to November 2nd. Santa Cruz Xoxocotlán is a small city and municipality located 5 km from the state capital of Oaxaca in the south of Mexico. It is part of the Centro District in the Valles Centrales region. The name comes from the Nahuatl word “xocotl” which means “sour or sweet and sour fruit” with the duplicative “xo” to indicate “very.” The meaning of the entire phrase means “among the very sour fruits.” The Mixtec name for the area was Nuunitatnohoyoo which mean “land of the moon-faced flowers.” However, the community is most commonly referred to simply as Xoxo. Ocotepec is a small town to the north of the city of Cuernavaca, but within the municipality of Cuernavaca. The name Ocotepec means “on the hill of the ocotes, or Montezuma pines.” It is located only minutes from the center of Cuernavaca on the highway that leads to Tepoztlán. The community is divided into four neighborhoods based on the major churches in town, which is an organization left over from the colonial period. The four neighborhoods are Candelaria, Dolores, Ramos, and Santa Cruz, each with its own patron saint and feast day. This organization is part of the reason why this community has managed to maintain more ancient traditions, a number of which date from the pre-Hispanic period. Ocotepec is one of the most traditional communities in the municipality of Cuernavaca. On the main road through town, there are dozens of stores specializing in handcrafted clay, stone and wood pieces, as well as rustic furniture. Among these shops are restaurants and food stalls specializing in barbacoa and cecina. The Alfeñique fair or feria del Alfeñique is an annual event that takes place in the city of Toluca, Mexico in which vendors sell traditional sugar skulls with names labeled on the forehead, as well as candy in a variety of shapes, in order to celebrate the Mexican holiday Día de Muertos. Chocolate and sugar skulls are used to decorate altars dedicated to the dead during the celebration. Herminia Albarrán Romero is a Mexican-American artist known for her papel picado and altar-making. She received a National Heritage Fellowship from the National Endowment for the Arts in 2005, which is the United States' highest honor in the folk and traditional arts. 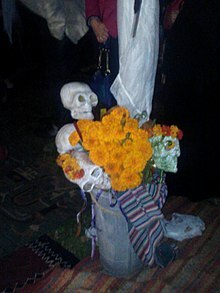 There is an extensive and varied belief in ghosts in Mexican culture. The modern state of Mexico is inhabited by peoples such as the Maya and Aztec. Their beliefs in a supernatural world has survived and evolved, combined with the Catholic beliefs of the Spanish conquest. The Day of the Dead incorporates pre-Columbian beliefs with Christian elements. Mexican literature and movies include many stories of ghosts interacting with the living. Cartonería or papier-mâché sculptures are a traditional handcraft in Mexico. The papier-mâché works are also called "carton piedra" for the rigidness of the final product. These sculptures today are generally made for certain yearly celebrations, especially for the Burning of Judas during Holy Week and various decorative items for Day of the Dead. However, they also include piñatas, mojigangas, masks, dolls and more made for various other occasions. There is also a significant market for collectors as well. Papier-mâché was introduced into Mexico during the colonial period, originally to make items for church. Since then, the craft has developed, especially in central Mexico. In the 20th century, the creation of works by Mexico City artisans Pedro Linares and Carmen Caballo Sevilla were recognized as works of art with patrons such as Diego Rivera. The craft has become less popular with more recent generations, but various government and cultural institutions work to preserve it. Sawdust carpets are one or more layers of colored sawdust, and sometimes other additional materials, laid on the ground as decoration. Sawdust carpets are traditionally created to greet a religious procession that walks over them. The tradition of decorating streets in this fashion began in Europe and was brought to the Americas by the Spanish. The tradition is still found in Mexico, Central America, parts of South America and parts of the United States, but it is strongest in Mexico and Central America. Pan dulce is the name for a variety of Mexican pastries. The creation of sweet bread was influenced by the French and Spaniards, who introduced baked goods such as crispy rolls, baguettes, and sweet pastries to Mexico. This inspired the indigenous peoples to create different types of panes dulces such as besos, conchas, and cuernos, among others. The bread is considered to be one of Mexico's most inexpensive treats and is consumed daily as breakfast or late supper, known as merienda. All Souls Weekend is an event in Tucson, Arizona. 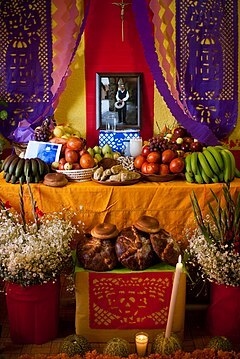 It draws on Mesoamerican, Spanish Roman Catholic, and Mexican rituals, incorporating many diverse cultural traditions with the common goal of honoring and remembering the deceased.